Christmas Countdown: Christmas is just 9 weeks away! It's winter and that means it is cold outside! Well, I guess that all depends on where you live, but we live in Michigan, and it gets cold here. Homemade heating pads are terrific gifts; they'll warm the recipient's heart and toes! This is still a beginner project for sewing, so don't feel like you can't do this. Say it with me, "YES, I CAN!" Wash and dry your fabric; iron as needed. Use the ruler to be sure all sides are even; most fabric cut at the store are not. Pin the right sides of the fabric together so the wrong sides are facing out. Sew one short end and both long ends. If you want to use essential oils, mix the rice and oils together in a bowl at this time. Turn the pad inside out so the right sides of the fabric are now facing out. Make sure the corners are all squared away and iron the fabric again. Top stitch along the one short end and the two long ends. Add about a half of a cup of the rice mixture to the bottom of the fabric. Measure out about 3 inches and mark that measurement with chalk. Sew along that line. Add another half cup of rice and measure another 3 inches. Mark the line with chalk and sew along that line. Repeat three more times. To end the project, add one more half cup of rice, then sew the ends together. I ironed my ends underneath, then sewed along the top, so the pad would have a finished look. I'm not a fan of frayed ends. Tip: If you're having trouble sewing along the chalk lines (the rice does tend to get in the way), pin along the line. I found that helped keep the rice in line. 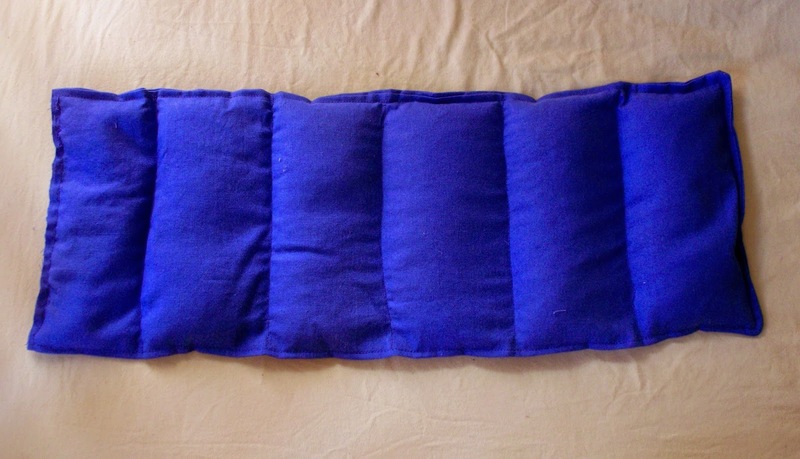 Bonus Idea: Don't feel like making a full-on heating pad? No worries! From fleece, cut out a circle that fits in the palm of your hand. Sew around the edges of the two pieces, and before sewing it totally shut, fill the inside with rice. Sew the circle shut. Make 2 of these and you have two hand warmers. Shh, I made some to stick in Jason's Christmas stocking!